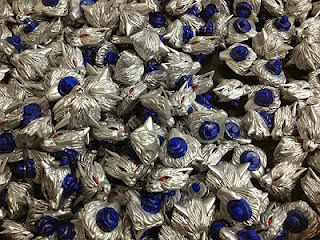 The generous crew at Onell Design are teasing upcoming figures during their current trip to China. In the post titled Big Boys you'll see an Armorvor that's no doubt inspired by the blue metallic Stealth Armor Iron Man, which has had numerous awesome action figures from Hasbro over the years. This may also be the first metallic plastic Armorvor figure. In the images you can also see a Crayboth figure, Power Lords parts, and other Glyos things which are hidden in plain sight that I can't quite make out. Click here to see them. In a post about Paint Masks, Onell Design gives us a sneak peek at a future Armovor head! Of note, it looks like we'll finally be getting a Blue Plastic Armorvor if the neck peg is any indication. And I'll be buying it, because of course I will. Expanding the Armorvor universe is this beauty! 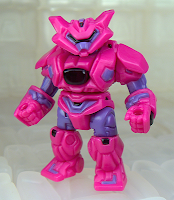 Click here to preview the latest Onell Design friend of the Battle Beasts, now available in a blisteringly bright pink. Is it awesome? Yes, yes it is. It goes on sale at 9:30 Eastern Sunday (tonight) at the Onell Design store. It should be sold out before midnight. As always, please let me order mine first because we wants it. Thank you.